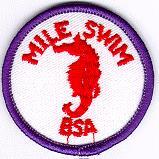 The Mile Swim, BSA Patch is NOT worn on the Uniform. Earned by Boy Scouts, Venturers, Sea Scouts, and Explorers, and adult leaders in these programs. Note: This award can also be earned and worn by adults.